Dress for the wild and an event to remember! 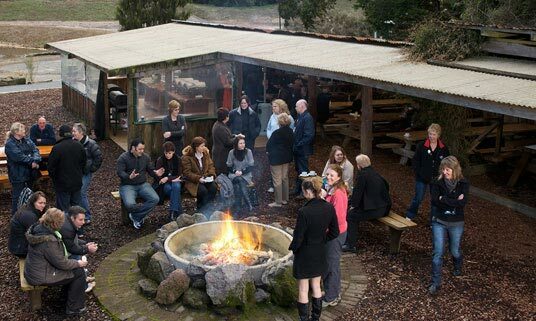 Following an action-packed Rotorua team activity programme, our rustic-style Native Bush Camp Rotorua function venue, is the perfect setting for a catered ‘feast in the wilderness’ experience. Party on into the night with drinks, food and entertainment; or simply kick back with Mother Nature and soak up the tranquility with good food, good wine and good company. Your catering options include bringing your own food and drink or leaving it to the professionals to do it all for you. For the latter option, we recommend any of the local major hotels or we can put you in touch with other local caterers. 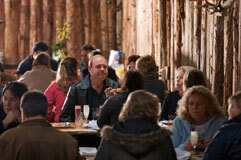 Set amongst beautiful native forest the large, covered dining area accommodates groups up to 140 people in all weathers. 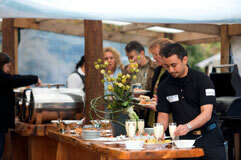 Larger groups are catered for by hiring in a marquee, additional seating, tables and other required equipment. Packages include BBQ hire, campfire, lighting, patio heaters, toilets, Off Road NZ staff, easy coach access, hot and cold water and ample parking. Let the Off Road NZ team assist you with all aspects of your Rotoura event, including catering, music and entertainment options. Please note the above prices are based on groups undertaking Off Road NZ activity programmes in conjunction with their catering arrangements.